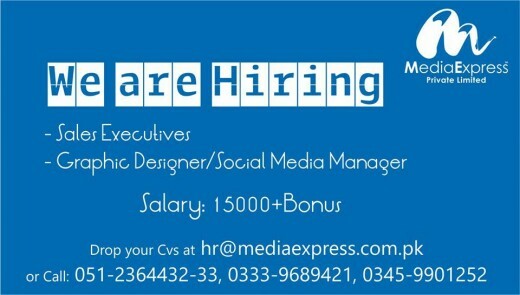 Media Express (Pvt) Limited Islamabad is the first and only 24/7 advertising and media marketing company. The company provides the services like printing press, advertising, branding / re-branding, promotions and marketing, corporate giveaways, legal assistance, event management, domain registration, web development, business development, web hosting, promotions and marketing, franchising and web and graphic designing. We need to hire the services of the graphic designer, social media manager and sales executives. Al Hameed Mall, G-11 Markaz, Islamabad.